When a tenant decides to renew, renegotiate or relocate their office space they have to deal with multiple financial risk factors. Typically, a tenant signs a long term lease in which the economic terms are based on the current market conditions. The economic terms of the lease will impact their bottom line for years to come. 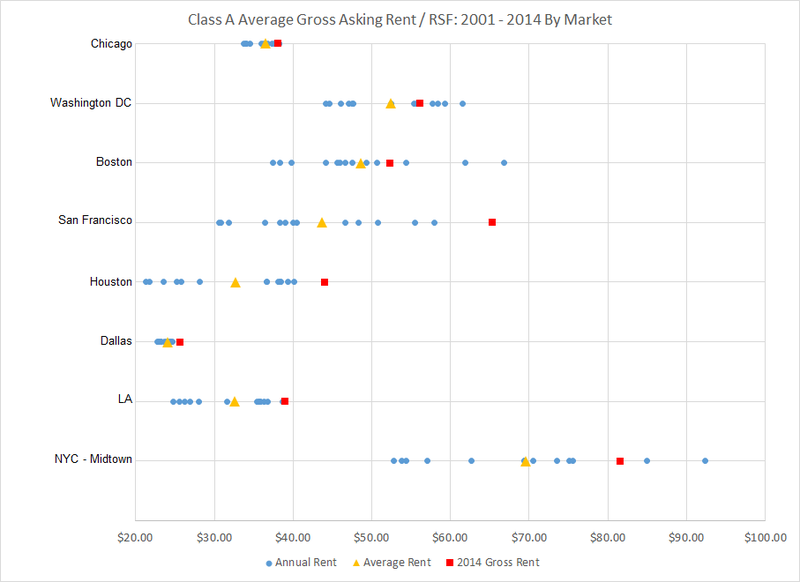 I examined average Class A office building gross asking rents on a per rentable square foot (“RSF”) basis across 8 major US office markets. I used year end data from 2001 to 2014 (14 years). My goal was twofold 1) to understand rental rate spreads in a given market in context of its 2001 – 2014 history and 2) to quantify the potential variance in rental rate changes on a year over year time period. In the chart below, each line represents a central business district Class A office market. – Each blue dot on that line represents the actual average Class A asking gross rent per RSF in a given year (2001 – 2014). – The orange triangle represents the average over the 14 year period. – The red square represents the most recent year of data (2014). This chart will help a tenant understand where current Class A market rents align with the market’s historical rent spread. 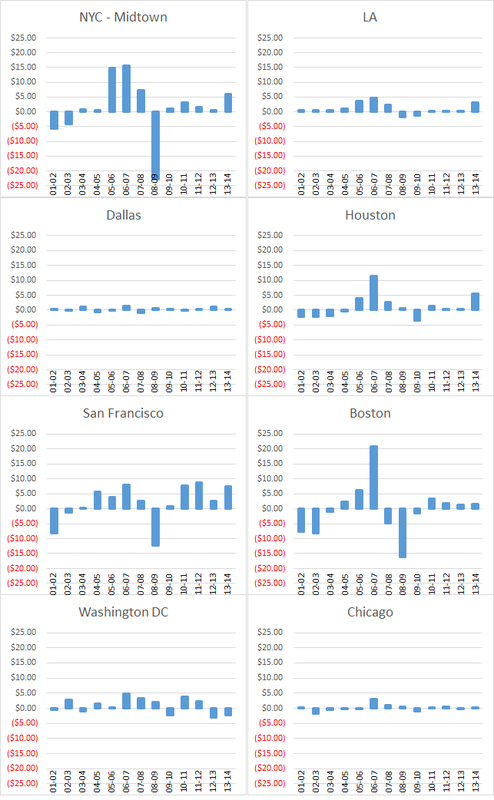 As shown below, the historical spreads in rents in Chicago and Dallas are narrow as compared to the other markets. In order to understand the potential risk of a large spike or large decline in gross rent on a year over year basis, I calculated the year over year dollar change in rents. This analysis shows that cities like Chicago and Dallas historically do not produce large spikes or declines in rents on a year over year basis as compared to markets like Boston, New York (Midtown) and San Francisco. It’s good to remember that these numbers are based on averages across entire markets thus smaller subsets may see different types of rental swings (i.e. high rise space, a specific submarket within a city, great view space or large blocks of contiguous space). As a tenant, it’s important to understand the current market conditions as they relate to the markets historical context as well as the potential risk of rent spikes. For tenants in Chicago, historically the risk of a large year over year spike in rents has not been a major concern. As they say in investing, “past performance does not predict future results” but knowing the historical swings in rental rates may help influence a long term lease decision.